This entry was posted in politics, Russia and tagged Dutch Safety Board, Malaysian Airlines, MH17, Russian Federation, Ukraine. Bookmark the permalink. These warheads are no longer used in the Russian Federation as they are past their use-by date. But the manufacturer had reported servicing the older Buk systems own by Ukraine in the last 10 years. I would put little weight on conclusions as to who fired upon the the craft based on the type of missile systems, until assured that no black market trade in such armaments is, or had been, occuring. We are dealing with a civil war and with militias, militias commonly obtain munitions illegally. Agreed Richard. That is why I am not being definite. On the balance, I think most likely a Ukrainian Armed forces system was used – whether by the rebels of the Ukrainian army. There has been a very large number of defections form the Ukrainian army to the rebels so this would be the most likely source if the rebels had an active system. And I think the social media story of a Russian system being specially imported for the job is unlikely. But there is plenty of black marketing (hell, the Russians are actually building a fence on their side of the border to prevent arms being smuggled into Russia!). And there are large dumps of old Soviet arms in Ukraine, Russia and Transnistria. And if authorities (in contrast to mercenaries) in the Russian federation are secretly supplying arms they would most likely provide the old armaments anyway as a cover. It is secondary in the sense that it wouldn’t have happened without the armed conflict in the Donbass. And that armed conflict would not have happened without the coup in Kiev. In that sense, the Ukrainian authorities must bear responsibility. But politically Ukraine is divided between those who oppose any autonomy for minorities and wish to impose their pure version of the Ukrainian nation on the whole country, and those who wish to have a democratic, multi-ethnic state. The current government in Kiev is trapped and cannot break out of its current anti-autonomy position because of strong political opposition from the nationalists – many of them little better than Nazis. This also means that Kiev is unable to carry out the political and economic clauses of the Minks agreement – every time they make a move in that direction the nationalists mobilise to threaten the government. The ceasefire is now pretty effective, but it cannot last with the current blockade of the east by Kiev and refusal to move on the political clauses. Meanwhile, the people in Crimea seem pretty happy to be well away from that mess – whatever claims are made about the legality of their decision. It almost sounds like you are saying the ends justify the means. Perhaps in a sense it does for the Crimeans. After all the internationally legal right for a people to determine their own situation is recognised in law. And the rights of the whole nation state were subverted in this case by an illegal coup. Crimea is often compared to Kosovo, but at least the Crimeans have the legitimacy of a democratic decision. The Kosovans didn’t. And surely the people in Crimea must be very thankful that their political decision prevented the catastrophe that befell the Donbass where cities and villages were bombed and many people lived in cellars or bomb shelters for long periods. I am unaware of any poll that was taken by the people of Crimea, or any referendum in which it was decided that Russia would be welcomed to roll in and seize control of the area. If you could provide some kind of proof that the people of Crimea really wanted Russian tanks to invade their province I would really like to see it. ” . . . the people in Crimea must be very thankful that their political decision prevented the catastrophe . .” By “their political decision” you must mean surrendering to the Russian military. According to Putin in a recent TV documentary on Crimea and its return the leadership of the Russian federation also asked for polling to be done beforehand when they were considering intervention. I don’t recall any tanks rolling into Crimea – although there were tanks and artillery heading in that direction – Ukrainian tanks, not Russian. I was amazed that it had come to that and just could not believe that the Kiev junta would actually end up firing their artillery against Ukranian villages. Armed forces of the RF did not invade Crimea – they were already there and although some were brought in by helicopter during the emergency the treaty numbers were never exceeded. There were surrenders of Ukrainian bases and ships to the local authorities – in most cases they were in effect defections. (Even in the Donbass fighting there has been a huge number of defections – even president Poroshenko said 30% of his armed forces had defected – the number is probably larger). The presence of the RF armed forces did make possible the break away of this autonomous region and prevent the overthrow of its government (as happened in Kiev and many other regions). All without a shot being fired. Crimean support for return to Russia and opposition to the ultranationalist regime in Kiev is hardly surprising. They have voted before for such a return soon after the USSR broke up and they have maintained quite a degree of autonomy. They are mostly Russian people after all and the transfer from Russia to Ukraine was probably illegal as it was not confirmed by the Supreme Soviet. (There is a rumour the Krushchev was drunk at the time 🙂 ). Actually, Crimea is only one example of what many Russians see as a tragedy resulting from the dissolution of the USSR – the fact that so many Russian nationals ended up outside their own borders, often without their citizenship of the new country being allowed (eg Latvia) and restriction on use of their language and its teaching (an issue in Ukraine). These problems may have been handled better by Russia early on if it hadn’t been so weak and ruled by criminal gangs and oligarchs. As it was, the situation of territories like Crimea and the breakup of the loose confederation after the USSR breakup despite referenda opposing it was a factor in moves to impeach Yeltsin (and probably one of the things he apologised for in his resignation speech). And who opposes the current status of Crimea? At the moment, there is a blockade inhibiting trade between Crimea and Ukraine. It is manned by a fascist group – the right sector, and an extreme pro-Tarter group. Despite the Kiev government disapproving of the Right sector (after all this group and Svoboda are responsible for recent grenade attacks in Kiev, they have allowed some of their police to assist this blockade. I personally cannot see Crimea returning to Ukraine (and I suspect few Ukrainians expect it). Given the wishes of the Crimean people have been expressed and followed I think the rest of the world will eventually give up using this as an excuse to heighten international tension. 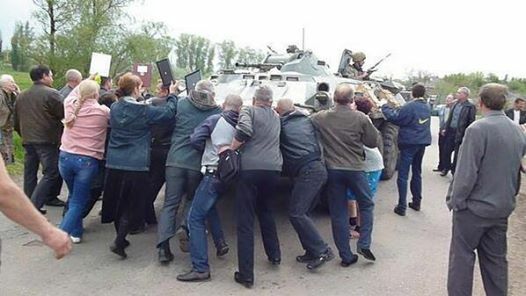 David, do you remember these images from last year after the coup – people in Ukraine attmetping to prevent tanks heading for Donbass and Crimea. Actually, a full discussion of the different constitutions would be fruitful. As you can see from your quote these were of particular relevance to Crimea which had already lost the degree of autonomy it previously had held, and had voted for, because of constitutional changes. It is one thing to criticise details of the referendum question (after all it took place as a matter of urgency when extremist groups had already attempted to occupy the parliament) it is another to deny that the people preferred return to Russia over even a higher degree of autonomy. Interestingly, though, the existing Ukrainina constitution had already been abandoned because of the coup (and this was confirmed in the Rada). Ukrainians had been chafing constitutions almost as often as they changed their socks – and illustration of the corruptions and control by oligarchs and criminal gangs. The question of autonomy is central to what has happened in Ukraine and to its future. The Minsk agreement ( which was approved by representatives of Ukraine, Donetsk and Lugansk) accepted this. Unfortunately Kiev is unwilling, or unable, to carry out that agreement. Which is a pity because the ceasefire will not hold forever without progress with the political and economic clauses.